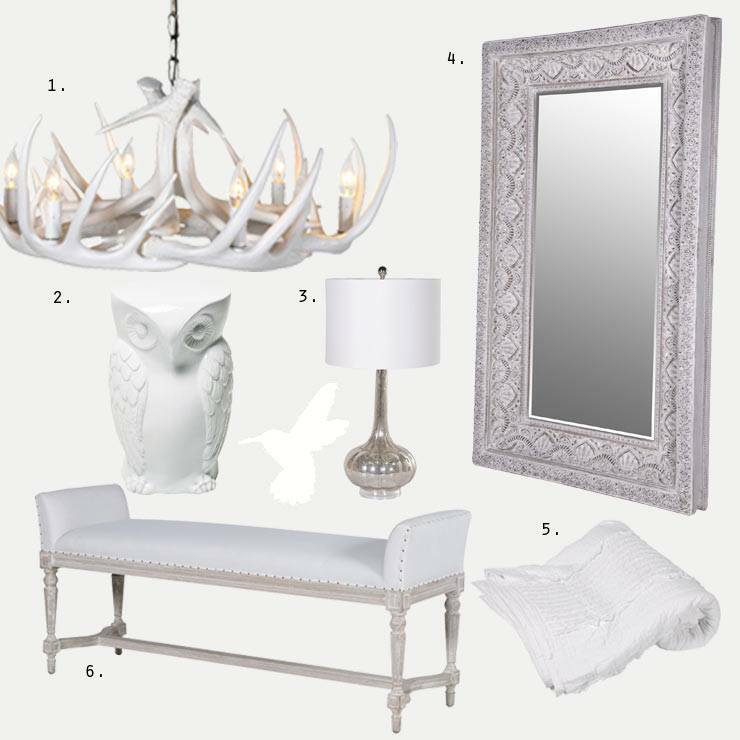 It's no secret that we, at The FBC, love white, it's elegant, ethereal, brightening, sparkling and flawless, but we've been looking a little deeper into why we love the many shades of white. As children we mix paints, it's a part of what children do! We dollop colour after colour on top of one another until we end up with a dark, murky shade wondering how mixing vibrant hues such as royal blue, pillar box red and emerald green could end up with something quite so non-descript. Little did we know as children this process has a name - subtractive mixing; as each colour is added to the mixture, the gloop reflects less and less of the visible light spectrum. On the opposite side of this uninspiring, drab concoction is the more promising additive mixing - where combining different shades of light shades will result in a shining white tone. White is not a colour that exists in nature, which is perhaps why its sparkly newness appeals so much; The gravitation of a fresh, crisp white shirt is unparalleled in the same way freshly laundered white bed linen is one of our greatest pleasures! Summer is the time to exploit any whites from your wardrobe - they exude a sense of style and glamour, even if it is partly because you've managed to avoid a smear of chocolate! For us, a flowing white dress or oversized white shirt with flip flops always reminds us of warm summer evenings in Ibiza - a nostalgic feeling we're always happy to reminisce. 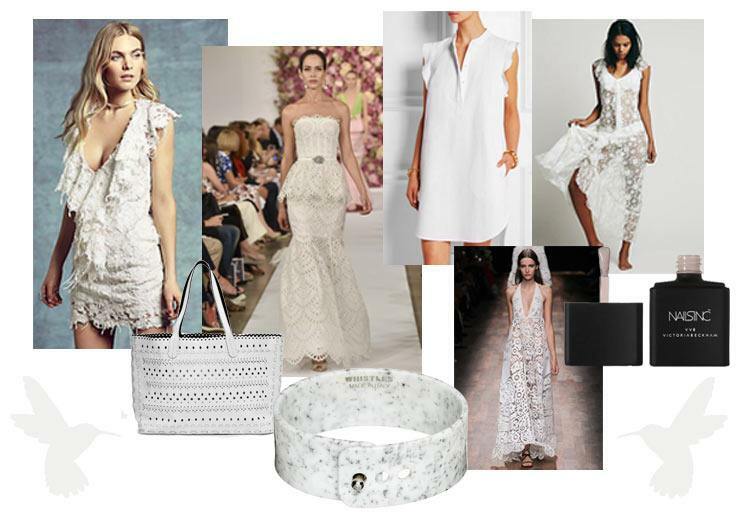 For summer 2015 designers flocked the runways with an abundance of whites, the emphasis on artisan craftsmanship: fine lace, broderie anglaise and delicate cutwork. From top left: Destroyed Lace Dress from Free People, £340; Leather Tote by French Connection, £67; Oscar De La Renta dress; Marbled Resin Cuff from Whistles, £25; Stella McCartney Ruffled Shirt Dress, £485; Valentino Floor Length Dress; Floating Flutter Maxi from Free People, £128; Victoria Beckham for Nails Inc. polish in Bamboo White, £25. The Scandinavians have nailed a pure, clean aesthetic in the home, partly due to their shorter, darker days. 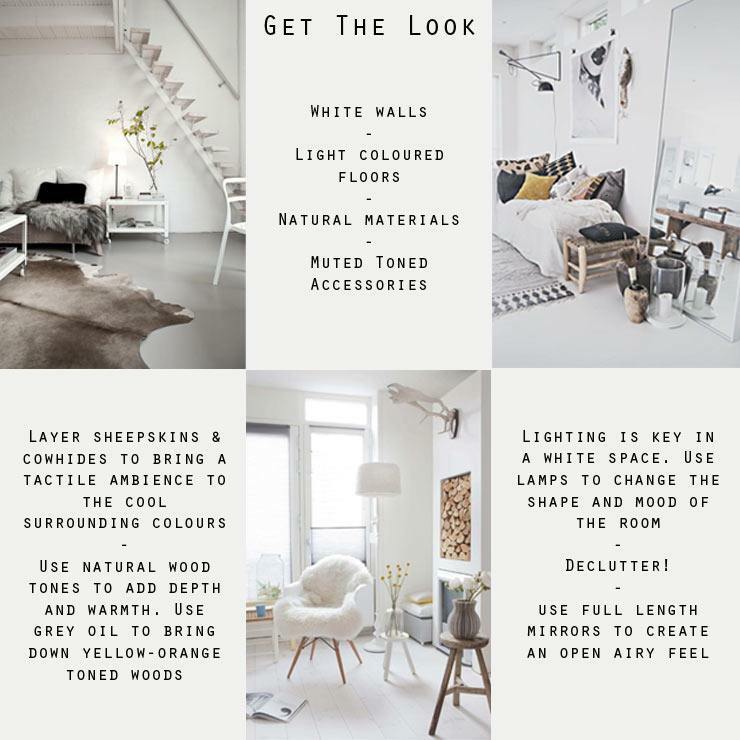 Unless you've been under an interior's style rock, you would have undoubtedly been bombarded by beautiful, functional, understated homes with vast white walls and floors from our northern neighbours in our magazines, social media and blogs. The Google search for "Scandinavian white" generates in excess of 55m results! 1. White Antler Chandelier, £429; 2. Wise Owl Stool, £95; 3. Serenity Glass Table Lamp, £99; 4. Ibiza Floor Mirror, £595; 5. Sofia Throw, £145; 6. Ivory Shabby Chic Bench, £399.